Today I sat on a hospital bed and held my grandfather's hand as he took his last breaths on this earth. This was the first time I have ever watched someone die. I am relieved to say that it was peaceful. We were all there at the end and surrounded his bed. We had been talking and Oma (my grandma) and I were talking about how hard it is just to wait for death to come because we knew it was just a matter of time. Not five minutes after we had said this Opa's breathing dramatically slowed and I called the family to be around him. I was happy we could all be there so that he and Oma wouldn't be alone, but nothing about death is easy. I am supposed to find comfort in the fact that he is now in Heaven and a better place and lived a long and happy life, but when I would rather have him here- that is difficult to wrap my head around. Instead of talking too much about his final moments I thought I would tell you a little about his life! His life was worthy of a movie script. 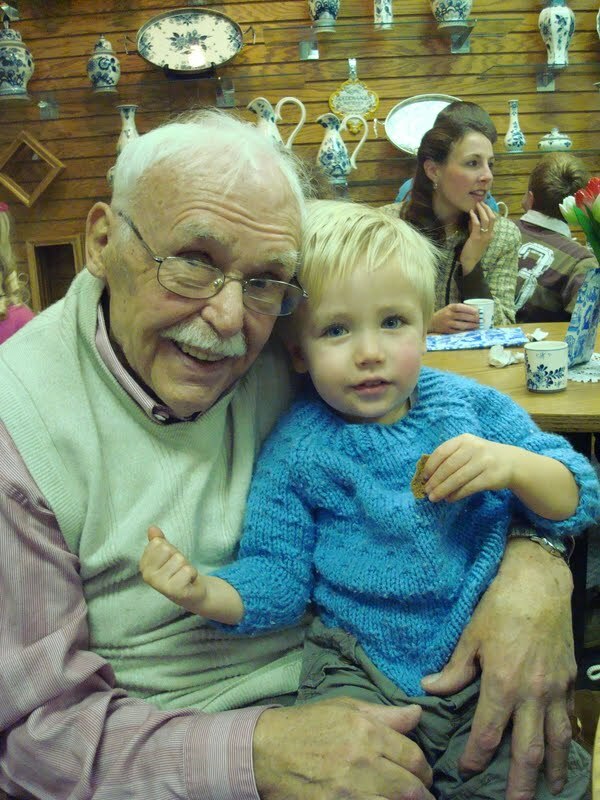 Here is the shortened version: He was born in 1924 in Lieden, Netherlands, survived wartime hardships like having to dig holes to hide in from the Germans so he wouldn't have to fight in their army. He met Oma and went home and told his mother she was the one he would marry - it was love at first sight. Always building and tinkering, Opa once built a row boat in the bedroom of his apartment! With his family, he immigrated to the United States in 1957. He, Oma, his son, Henk, and my mom came over on a boat! He and the family were sponsored by our church. He told us that they went to dinner when they first got to Michigan at someone's home and they served jello with fruit in it. He had never seen it and thought it was fish eggs! He politely ate it anyways! He was a hard working and worked at the same job for many many years. He and Oma were together for 67 years! They couldn't marry for a bit after the war because they had nothing. Opa had to trade his short pants for a pair of longer ones for his wedding because that was all he had! They were married for 62 years! Every part of Opa was strong. His personality as well as his physical strength. The man went through more accidents and obstacles then any other human being I know and rose above each and every one of them with a smile on his face and a twinkle in his eye! He never sat down and let things happen to him. He made them happen for the better and did it with a smile. Opa always seemed to have a smile on his face and a twinkle in those bright blue eyes of his. He had a way with children and a way with the ladies. We could always count on Opa flirting with the girls and making them laugh. He could put a smile on anyone's face at any time. He flirted with his wife most of all though and never left us guessing who he cherished above all others. He was a lot of fun, but he was no none sense as well. He taught me how to row a boat, bait a hook, dive, call swans, and tried to teach me to sail - to name a few things. He could get a room in giggles in two seconds and quiet it just as fast. When I was young every weekend in the summer we spent with Oma and Opa up at a lake. One of our traditions was going to Suzie's Ice Cream parlor. I had a hard time deciding what flavor of ice cream to get. I never wanted to the same one because I wanted to try them all so it had to be just perfect! So I was almost always the last one to get my ice cream and probably the last one to find a place to sit. On one particular day I was milling around and everyone was waiting for me to sit. Opa sternly and not too quietly said, "Sit!" to me and every person in that place found a seat within 5 seconds flat! The dog on the porch even sat down! I could go on and on and on about Opa. I feel extremely blessed that he was part of my life and the lives of my children for so long. He showed me how a person should attack life and live cheerfully. He showed me how to be respectful and demand respect. He loved me without reservation and I loved him fiercely. He was a man to admire and one you wanted to be around. I miss him already! Lola loved giving Opa kisses! I think he got the most kisses from her out of everyone!